Water fountain in town centre mall commemorates the centenary of the first water supply for the Richardson district. The fountain also commemorates 100 years of the National Bank`s operations in Donald. The bank contributing significantly to the construction of the fountain. In the Mallee-Wimmera area there is no run-off to fill farm catchments. A channel scheme to link a larger river to a local river was of great importance to the local community. 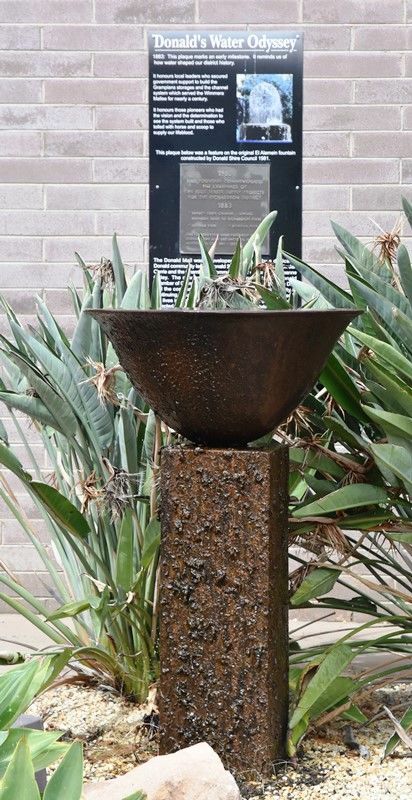 1983 This fountain commemorates the centenary of the first water supply projects for the Richardson district 1883. Swede`s Creek Channel - Linking the Wimmera River to Richardson River. * Donald Weir * Banyena Weir. This fountain was made possible by public subscription and the National Bank of Australia Ltd 1881 - 1981.